Looking back on the year about to close, CatholicPhilly.com published almost 300 local Catholic news stories, not to mention hundreds more features, photos, commentaries and news from around the United States and the world. Picking the top 10 local Catholic news stories will always omit important stories, as in any “top” list. But we’ll give it a go, anyway. 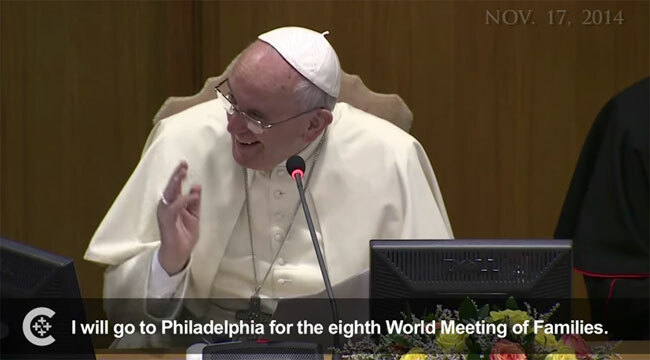 The pope ended months of eager speculation Nov. 17 by confirming he will visit Philadelphia September 2015 at the close of the World Meeting of Families in the city. Catholics here were thrilled even as they planned for the big events, and Archbishop Chaput reflected on the Pope Francis he’s gotten to know. Net proceeds from the sale of six skilled care homes and one independent living facility, expected to be $95 million, will address long-term financial issues of the Philadelphia Archdiocese. Toward the end of the year, the archdiocese said its finances continued to show improvement. Auxiliary Bishop Daniel E. Thomas received a new assignment from the pope as the new bishop of Toledo. He had many fond memories of his time as a priest and bishop in his native Philadelphia Archdiocese and shared the story of a providential link to his new diocese. Twenty-nine parishes in the archdiocese merged into 13 beginning in July. By October, another 14 were slated to begin the planning process. Even though Mass attendance figures for the archdiocese continued to show decline, the rate slowed last year. The sale of the properties, which included the Don Guanella Village site in Delaware County, along with the conclusion of the lease of Catholic cemeteries and the sale of the nursing homes, was expected to address major underfunded financial obligations of the archdiocese. In November the families’ congress officially started to welcome the first of the expected 15,000 to 20,000 visitors from around the world to Philadelphia Sept. 22-25, 2015. Organizers offered insights into the congress’ program of talks and activities. Meanwhile, the call went up for local residents to open their homes to the visitors, Catholics began praying for the success of next year’s events. Almost 2,000 Catholic teens and others enjoyed the music, fun, food and prayers during the outdoor Abbey Faith and Music Fest in September. Along with the Christian musicians and artists were liturgies, sacraments and an inspiring display of vocations. Remember the mind-numbing cold of last January? Catholic aid workers reached out to help homeless people who remember it all too well. Not to be outdone, a month later the winter delivered snow and ice storms that shut schools and cancelled buses to the annual March for Life. And still, the aid to people in need never stopped. The archdiocese lost its bid to block regulations of the Affordable Care Act (ACA) in June, but a day later, a new ruling prevented the church from paying fines of $160,000 a day for noncompliance. In another legal development, a Pennsylvania judge overturned the state’s Defense of Marriage Act, which Gov. Tom Corbett did not appeal. In May six young men were ordained priests for the archdiocese this year, hundreds of their elder priest-brothers gathered to share friendship and prayers, and a dark chapter of the priesthood in recent years came to a close. Also, seven permanent deacons were ordained by Archbishop Chaput.